Harry A. Franck was one of the foremost travel writers of the first half of the twentieth century. His first book, published in 1910, was "A Vagabond Joumey Around the World". More books followed; his last published book (Rediscovering South America) came out in 1943. For a complete list of books published during his lifetime, see the HAF Books page. Mr. Franck served in the American Expeditionary Forces in World War I as a Second Lieutenant. He was primarily attached to headquarters in Paris where he was "Base Censor," among other duties. He also took part in the Italian Campaign. After the war he went back to his writing career, married the former Rachel Latta. 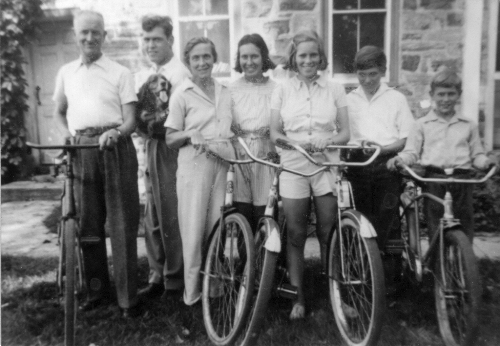 They bought an 18th century farmhouse in New Hope, Pennsylvania, where they eventually raised five children. During World War II Harry was urged by many people to join the army "to teach geography to generals". He signed on on June fifteenth, 1942. When he put his birth date down on the application as "June 19, 1881" the recruitment officer said "Oh, that just won't do" and changed the date Mr. Franck had put down to "June 19, 1886". From December 1942 to November of 1944 he was assigned first to a field basic training base near Miami Beach, Florida, then to Amarillo Field, Texas, and finally to Lowry Field, Colorado. In Miami he was on the Section Eight Board, helping to catch malingerers and to weed out true misfits--chronic bed-wetters, soldiers so home-sick they couldnt function, etc. He was also Post Historical Officer there and at the two subsequent posts. From November, 1944 to June 1945 Major Franck was assigned to the Ninth Air Force in the European Theater of Operations. He and an assistant, Lieutenant Charles O. Porter, were to write the story of the Ninth Air Force in action. The book they wrote is titled "Winter Journey Through the Ninth". A book on the Eighth Air Force was published almost as soon as the war ended, but theirs on the Ninth was held up by the Air Force for a very substantial length of time. Rumor has it that the Pentagon didn't want one piece of the history of the Ninth to get out--possibly because, at one point, they may have bombed our own troops. By the time the book was released by the Air Force, publishers were no longer interested in "War Books". Both Major Franck and Lieutenant Porter tried to "sell" Winter Journey but without success. (Lieutenant Porter was, by that time, Congressman Charles O. Porter from Eugene, Oregon.) 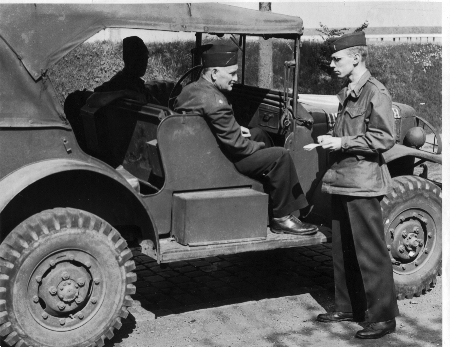 On April 30th, 1945, Major Franck had taken time out to visit the 11th Armored Division in Bavaria, near the Austrian border. He was watching a tank battle when a piece of shrapnel hit him just over the eye. For that he was given the Purple Heart. In June, 1945, Major Franck returned to Lowry Field, Colorado, where he stayed three months. Next he was at Keesler Field in Mississippi, then at Gravelly Point (the Pentagon, really) in Washington D.C., and back again to Keesler Field. November 11, 1946, he went on terminal leave and he was discharged as a Lieutenant Colonel on January 20, 1947. Many of the changes of assignment were due to his age. He was well liked by his commanding officers and many of them were also fans of his books. However there was usually some eager beaver troublemaker who would look him up in "Who's Who in America", find out his real age, and start processing retirement papers for him. His commanding officers would bury the retirement papers at the bottom of their in baskets and wouldn't "find" them again until they had safely transferred him to another post. After the war Major Franck spent two years taking courses at Columbia on the G. I. Bill. For a number of years he acted as lecturer on cruise boats to the Caribbean, to South America or to the Mediterranean. He died on April 18th, 1962 of complications due to Parkinsonism and was buried in Arlington National Cemetary, an appropriate place for this veteran of two World Wars.